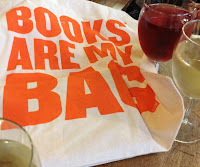 As it's no secret I'm a bit of a fan of bookshops, I decided the best way to experience the launch of the Books Are My Bag campaign was to take in a couple of places I wouldn't necessarily have visited on an ordinary bookshopping trip. And so I choose two opposites, bookshops which at first glance appear to be at different ends of the social spectrum and ones I'd not rated particularly highly on my 'expect to fit right in the moment you step through the door' scale. Not because I wasn't interested - their concepts fascinated me - but if any bookshop was to live up to the intimidating persona I'd applied to them back when I was a young teenager one of these was bound to be it. However, just as the book token of World Book Day gave me confidence to enter my first bookshop, so the awareness campaign of Books Are My Bag gave me the push (excuse) I needed to once again enter the unknown. My first out of comfort zone bookshop was also the first stop on my bookcrawl: stockists of first editions Goldsboro Books. And the word first is the reason I was so uncertain of my destination, after all just how expensive would a first edition be? I'd heard of books selling for hundreds, and have even seen a few myself back in the day when I volunteered in a charity bookshop, but the thought of going into a place filled only with first editions made me nervous. I have a rule that if I'm going to write about a bookshop I must buy something in it - I wasn't sure this was something I'd be able to afford to do at Goldsboro. And so I found myself dawdling as I made my way along Cecil Court. An area I'd not previously explored despite its proximity to Charing Cross Road, I was surprised to find it filled with even more bookshops to tempt me - on any other day I'd have happily lost several hours exploring , but today I was on a mission. Along I went to the Books Are My Bag decorated window of Goldsboro Books and the selection of Harry Potters it revealed. Still nervous, I entered the shop. The first book I spotted was priced around the £50 mark, but despite stocking a large number of expensive books, Goldsboro is still essentially just a bookshop (yes, I know it’s wrong to use the word just in relation to a bookshop) and so - thankfully - it took precisely ten seconds for me to realise my fears had been for nothing. I couldn’t help but be fascinated by the selection on offer, marvelling at the covers and featured authors, so that before I knew it I was happily chatting away with the bookseller as the striking cover of Marina by the wonderful Carlos Ruiz Zafon caught my attention. Signed and numbered and so new to Britain I didn’t even know it existed, I couldn’t believe my find. I was also relieved to discover this beautiful book was on sale for the cover price, so cancelling out my fears of living off beans on toast for the rest of the month. Book in glorious orange bag and fears of the expensive well and truly quashed, I happily made my way along Charing Cross Road for a little more bookshopping, before ending up in Bloomsbury Street at my next unsure of destination: Bookmarks. 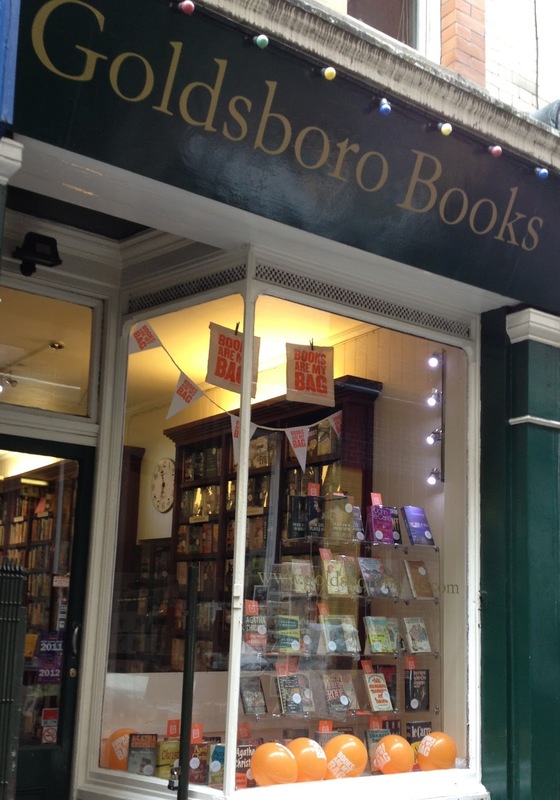 Not an obvious establishment to pair with Goldsboro Books, Bookmarks is also The Socialist Bookshop, and so here my fears were of my own ignorance. As someone who feels very strongly about the vote but doesn’t choose where to cast it until the day of whatever election is taking place, I’d known that while I wouldn't be completely lost here I could potentially stand out as not being socially aware enough. Would I walk into the shop and have my ignorance rubbed in my face as I failed to register knowledge of the issues? Would I even find a book I could realistically buy as subjects beyond my comprehension (or even sphere of knowledge) lined the shelves? The answers regarding my understanding are probably both yes and no, but after an initial moment of awe I soon found myself on a mini educational tour. With the books organised by theme and geography I took a journey around the world, wandering past the spines, picking up the names of inspirational people, horrific events, revolutions, campaigns and everything in between. There was even a suitably selected fiction area, filled with books to entertain while also making you think. However, instead of loitering in the relative safety of fiction I found myself drawn to the Middle East, an area that often makes headline news but is rarely explained to any satisfactory level in the allotted television time segment. And so I picked up Cairo, My city, our revolution by Ahdaf Soueif, a fiction author who here retells her personal account of being part of the Arab Spring. As I read in the shop I found myself caught up by her determination to make a difference and I’m sure it will be a fascinating and educational experience. In fact, so engrossed had I been in my exploration of the issues that it wasn’t until I got to the till that I noticed the total absence of BAMB decoration due to a technical hitch. 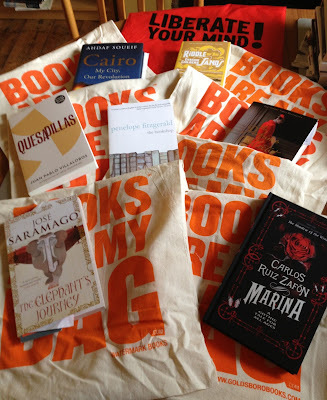 Not one to let an absence of free stuff put me off the good fight I still wanted my book, and was rewarded for my decision when later in the day the bookshop contacted me to let me know the tote bags had arrived and they’d keep one aside for me. While all bookshops help broaden the mind, Bookmarks goes above and beyond to highlight issues and educate, but not in a way that alienates the everyman. With more time I could happily spend a good few hours in the shop on a journey of self-education, safe in the knowledge I'd be welcomed and later leave with books that would take me on journeys to very different - but very real - worlds. My bookshop crawl continued with many more old and new experiences, but the very different establishments of Goldsboro and Bookmarks stood out for me because they were so opposite to my expectations. 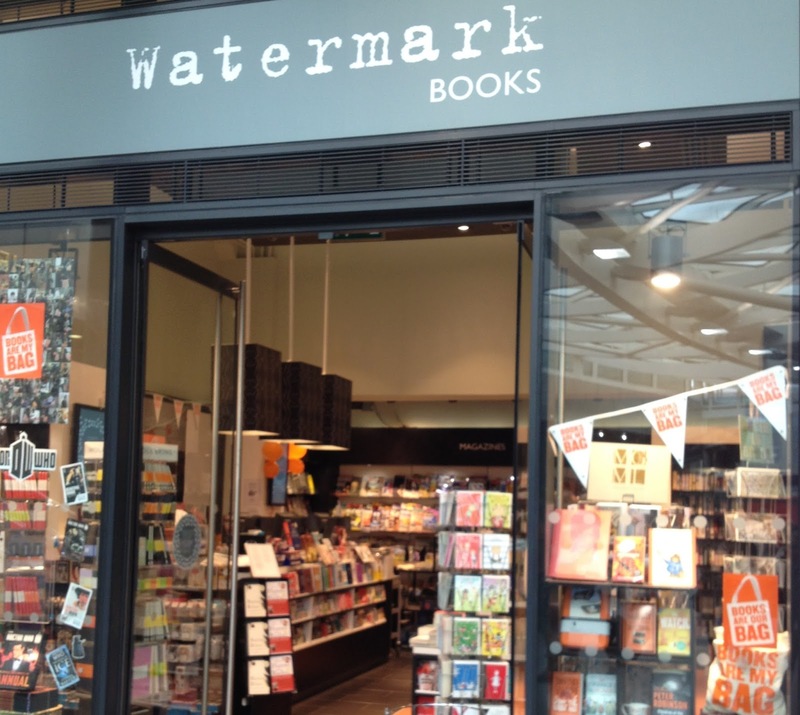 They were reminders of something all book lovers know: you shouldn't judge a bookshop by its cover. If you’re a fan of books then last weekend it was pretty hard to miss the sea of orange that engulfed our bookshops. From bunting and balloons to books and bags, the national campaign was encouraging book lovers and novice readers alike to return to their local bookshop and buy a book. The reward? 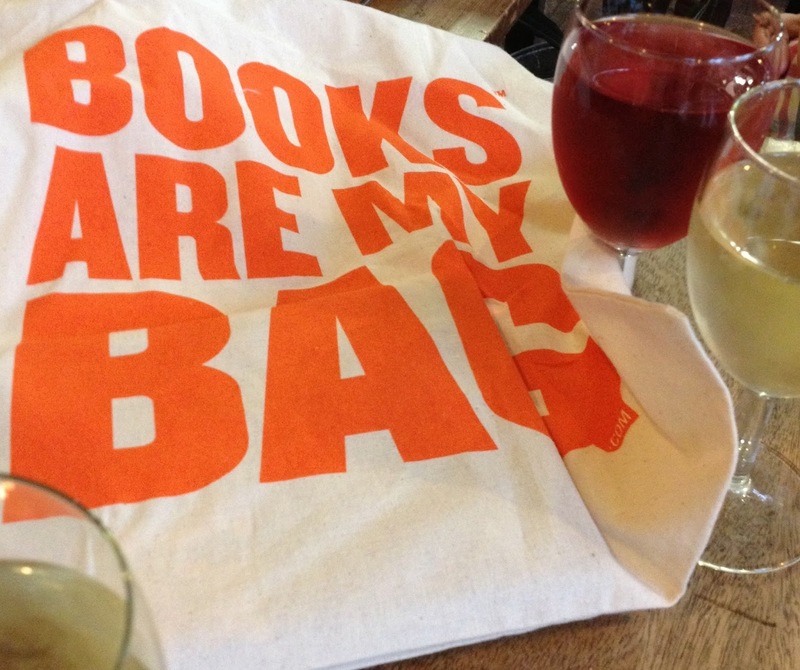 A Books Are My Bag tote, a portal to a different world and a reminder of just why bookshops are such great places to visit. But you knew that already. To ensure I enjoyed the full experience I set off on a bookshop crawl of London, visiting a mixture of old favourites, new finds and bookshops I possibly wouldn’t have considered going to during an ordinary day of bookshopping. 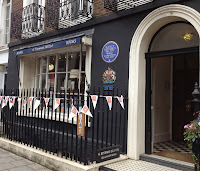 Stockists of first editions, Goldsboro Books was also my first destination and my first out of comfort zone visit. Fortunately, I found myself very wrong in my fear as I discovered that first edition needn't mean 'so expensive you have to remortgage your house' when I picked up Marina by Carlos Ruiz Zafon for its ordinary cover price. A book to be cherished in its own right, I suddenly found the acquisition of my first tote bag to be of little consequence, so pleased was I with my purchase. 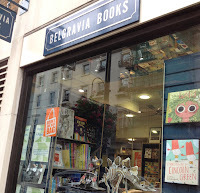 Whether it was my spangly new bag or the big grin on my face from my first book, I certainly caught the eye of a few startled shoppers as I merrily skipped along Charing Cross Road... Thinking about it, it was probably the skipping that made me stand out. 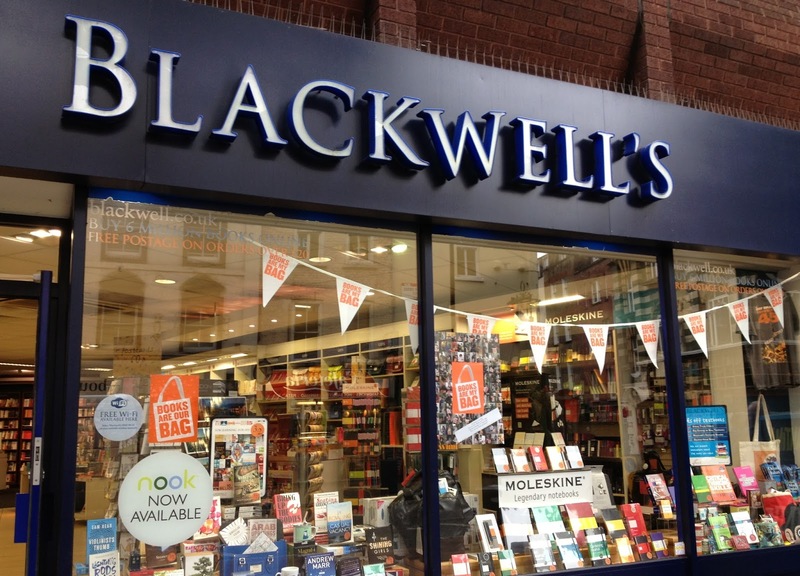 Blackwell's was my second stop, where I munched on a suitably orange Jaffa cake (or two) as I basked in the friendly atmosphere of the popular chain. Knowing I was on a tight schedule I found myself agonising over how I could possibly only buy one book, eventually selecting the appropriately themed The Bookshop by Penelope Fitzgerald. 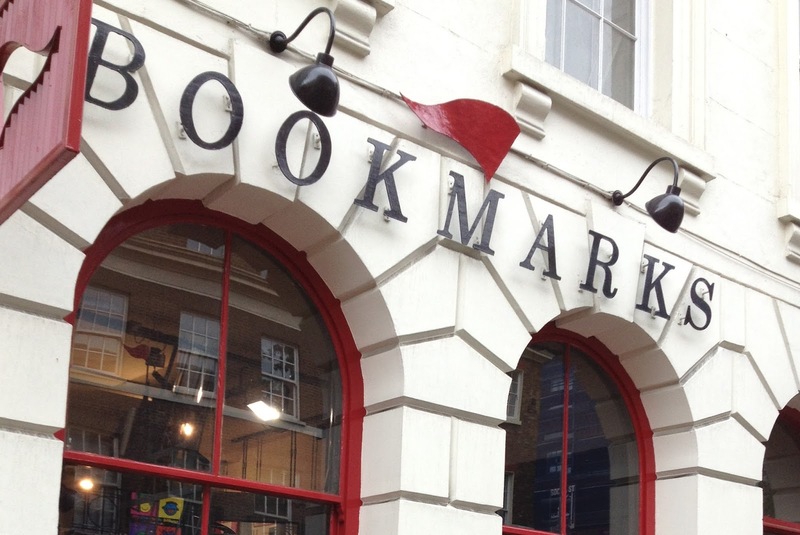 My next new experience was Bookmarks, the socialist bookshop on Bloomsbury Street and another destination I’d shied away from before BAMB gave me a good excuse to visit. As it was, the moment I entered I was fascinated, soon snapping up Cairo, My city, our revolution by Ahdaf Soueif. In fact, I was so engrossed in the books that it wasn't until I went to pay that I noticed the total absence of BAMB orange. A tweet exchange later in the day let me know the bags had finally arrived so I popped back for a bag with my name on it. 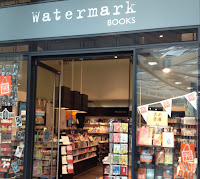 For bookshop number four I hopped on the train to Kings Cross and Watermark Books. Nestled between platform nine and three quarters and a Harry Potter shop, stepping through the door was magical as I left the bustling station for the calm of a space packed with all manner of books. After a brief play with Elmer the elephant in the children's section, I returned to adult life to buy The Elephant's Journey by Jose Saramago. G Heywood Hill to experience it in its full glory at a later date. Continuing south, I found myself at H R Stokes & Co in Belgravia. Had I been a random passer by, I probably wouldn't have realised this was a bookshop, but BAMB ensured I popped in for a look. While less than half the shop is dedicated to books - the rest selling all manner of delightful gifts and stationary - the woman I spoke to certainly showed a bookseller's enthusiasm. Being number six on my list, by this point I admit my energy was flagging, so I asked for help, had a lovely chat and came away with my excitement revitalised and a book by an author I love, Kathleen Tessaro's The Perfume Collector. My penultimate shop was Belgravia Books, just a hop, skip and a jump away along Ebury Street and not far from Victoria station. I unfortunately found myself running out of time here but still managed a chat with the bookseller, who helped me choose Quesadillas by Juan Pablo Villalobos as my lack of time had turned me into an indecisive ditherer. He also opened my eyes to the loyalty card Love Your Indie and the opportunity to bag a free book - how have I not discovered this before? And so, with seven books in my bag, we come to the final stop on my bookshop crawl, Ray's Jazz Cafe inside Foyles on Charing Cross Road, where I met up with friends to recover from all the excitement with a glass of wine and my first ever experience of live jazz. Having started the day with one first it seemed only right that I finish it with another, and while I sadly ran out of time to buy another book, I know I'll be back again soon. I may have only visited eight of the many hundreds of bookshops involved in the Books Are My Bag campaign, but I had a wonderful day and met some lovely people. Most importantly though, the campaign gave me the encouragement to visit some places I wouldn't necessarily have visited quite so soon on my bookshop adventure. In a similar way, I hope a few more people were encouraged to visit a bookshop they'd perhaps neglected previously either through lack of knowledge or maybe because they went online instead. And hopefully I won't be the only person planning to return to the bookshops they've discovered. On 23rd April, 1995, at the age of 15, my love of books was transformed beyond all recognition. This was the first day of the now annual World Book Day, and I had been given a £1 book token. It may seem quite a small thing to change a life, and indeed at the time of the presentation I rather felt it was preaching to the converted as my love of reading was no secret, but for that reason I decided I had to really make the most of my pound and use it for something different. And so I made my way to W D Wharton, the independent bookshop serving Wellingborough in Northamptonshire. I’d walked past it many times on my way from school to the town centre but always felt too shy to go in. I wasn’t particularly experienced with bookshops and had been to a library only a handful of times since leaving primary school, which meant a proper, dedicated bookshop wasn’t somewhere I felt entitled to enter. Instead I’d borrowed books from friends and family or even school, or settled for the limited selection WHSmith had to offer while trying out the coloured pens. But this day was different. Book token in hand, I felt I had an invitation to finally enter the bookshop. I won’t pretend to remember how I got on during that first visit, I can’t remember what I bought and I can only lay claim to the date because of Wikipedia, but I do remember the change it brought about. It opened my eyes to the fact a bookshop wasn’t the terrifying place or elite club I’d imagined. No one told me off for being there or criticised my choice of book, and I didn’t feel out of place among the other shoppers as we were all focussed on the rows of books and the delights they contained. It also opened up my world to a wider selection of books than I’d previously encountered. I was a convert. Since then I’ve explored a number of bookshops and I hope to visit many more, but even though it’s been about 15 years since I visited the town, the bookshop of W D Wharton still holds a special place in my heart. I admit, the front of the bookshop is vague in my mind, and I couldn’t even remember its name until I came to look it up last week, but the inside – the man behind the counter; the shelves of books, especially the classics which became my go-to area; and even the way the light fell through the window, all stick with me. As does the memory of some of the books I bought: I’m pretty certain my original copy of my all-time favourite read, The Age of Innocence by Edith Wharton, would have been purchased during one of my visits. Sadly I’m unable to revisit W D Wharton as it closed in the spring of 2000, but the love affair with bookshops it inspired is very much alive. And now - as I’m still just setting out on my adventure to explore bookshops around the country - I can’t help but wonder where my love of books and bookshops would be if I’d never been given that £1 book token and opened the door to a different world.